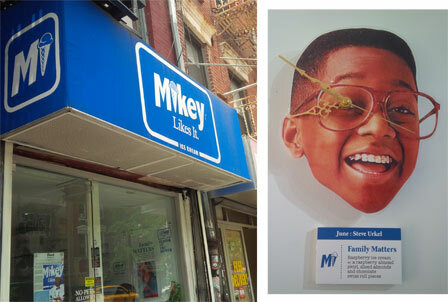 [Nick in New York City #4] ‎Last time I went to Mikey Likes It, I sampled every flavor that they had in stock. I had promised in my last post I'd try a Mac Daddy (waffle sandwich) and the two flavors they were out of that I was interested in. Well I was back in the East Village on Saturday and held true to my word. First up, it's a new month so of course I had to make my Mac Daddy with the new Family Matters Ice Cream. The new ice cream sounded awesome when I first heard about it. The flavor is Raspberry Ice Cream with a Raspberry Almond Swirl, Sliced Almonds and then Mikey went all Urkle on us and threw in some Chocolate Swiss Roll Pieces into the mix. I can see him in the back saying "did I do that?" Yes, yes you did Mikey and it was a brilliant addition. The raspberry ice cream is high quality as I'd expect from Mikey. Fresh, fruity flavor with more sweetness than tartness. I didn't really notice the swirl much visually except on one side of the sandwich. It does add a little more tartness to the flavor. The sliced almonds are ample and the nuttiness works perfectly with the base. However, the show stopper here is the chocolate Swiss roll pieces. Mikey didn't skimp on them and they're quite large. Little Debbie would be proud right now because these just brought this flavor up a notch. On its own, this is a very solid ice cream. 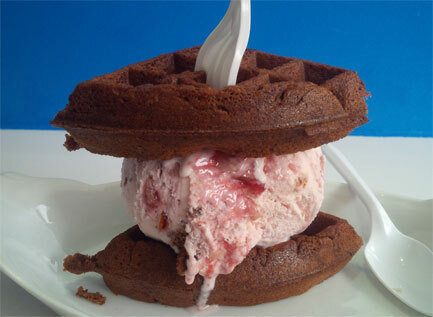 Throw it in between two warm waffles and you have pure bliss. Mikey's makes the waffle fresh and my waffle were basically right out of the iron. The warmness makes the ice cream more manageable and makes for one of the best sandwiches I have ever had. The waffles are very chocolately and rich. What I thought was awesome since they're so fresh, they have that golden crisp you expect from a properly made waffle. My hat is off to you Mikey, this combo is deadly and I aptly named it the "Did I Do That?" as well because man, I can't believe that happened. So, so very delicious. I also got a Daddy Mac with Southern Hospitality Ice Cream. I prefer the one waffle Daddy Mac to the two waffle Mac Daddy just because it's much more manageable. Think of a waffle a la mode concept. The waffle still plays a major part without being too much to handle at once. 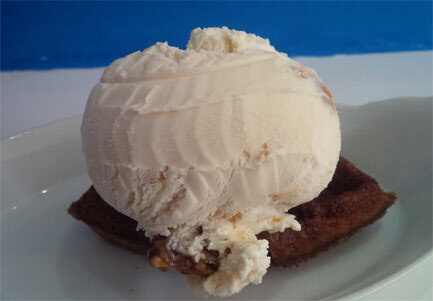 Southern Hospitality ‎is Pecan Pie Ice Cream with Praline Pecans and Pecan Pie Chunks. The ice cream is basically a supped up butter pecan and I loved it of course. My problem is my scoop was void of pie chunks but there was enough pecans to make up for this. Definitely a flavor I wouldn't mind sampling again in hopes of getting some pecan pie chunks next time. Last up, I finished my visit with a cup of their The Nutty Professor Ice Cream. This one was the one I was most excited for when they released their Spring/Summer line up a couple of months back. This ice cream contains Peanut Butter Ice Cream with Peanut Butter Cookie Pieces, Semi-Sweet Chocolate Chips and Dry Roasted Peanuts. 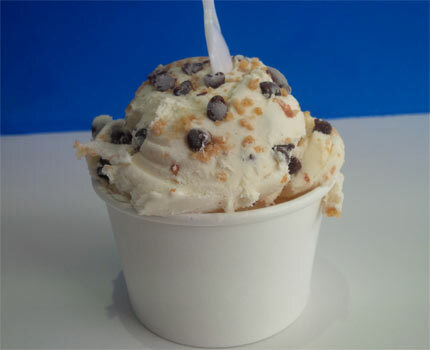 ‎This stuff was as awesome as it sounds and by far my favorite flavor from Mikey's on the current menu. The peanut butter ice cream is as close to eating peanut butter from the jar in flavor. The cookie pieces are ample and add some sweetness to the base. The semi-sweet chocolate chips aren't lacking either and add some bitterness to the equation. Throw in the dry roasted peanuts and you get some saltiness. This is essentially a flavor hitting the majority of your taste buds and you're doing yourself an injustice not trying this one if you're within 50 miles of the store. Heck, I drove over 150 miles and would consider it again just to get this ice cream. Mail me a pint or two, Mikey! I'm looking forward to seeing what July's flavor of the month is and I know I'll be back to try more of Mikey's options for sure. Please Note: Thanks to Mikey Likes It for providing Nick with these free samples. The use of cream filled baked goods such as swiss cakes/Ho-Ho's and Twinkies/Cloud Cakes, in ice cream is underused and I would love to see companies start making pints with these mix-ins. Maybe they have already experimented and it didn't work out. Maybe the cream filling doesn't freeze well. But if they do find a way to pull it off, it'll be hard to resist!